Have you ever started a creative project that went so badly you trashed it? I have–more times than I’d like to admit. I had heard that mistakes can be our finest learning experiences, but I’d not relished that idea until I reclaimed one of my discarded pieces, and unexpectedly discovered how to reclaim my life, too. An hourglass quilt block I had made from scraps contained too many mistakes to use, so I pitched it. The triangles didn’t have points; I could have done better when I was nine years old. The parallel lines weren’t parallel–they would have made a good class project for “Principles of Perspective in Art.” In one place, the fabric ran out before it reached the edge of the block. There was no mistake. It was beyond repair. Toss it, I must. But before garbage pick-up day, I needed a piece of fabric to practice on, and I didn’t want to waste new fabric. Aha! I had just the thing! I retrieved the square I had thrown away, thinking, “I can’t make it any worse than it is”. I plopped blotches of color here and there, with no rhyme or reason, except that I purposely covered up a few of the glaring errors I had made. After continuing to use it for several practice sessions, I dubbed it Chaos: it looked chaotic and it matched my life. I was recovering from chronic fatigue and fibromyalgia. At least, I hoped I was. On many days, I was better than I had been, but still not well enough to work more than a few hours a week. Other days I was as bad as ever. I couldn’t anticipate if I’d have energy on any given day. I felt like I was stuck on a teeter-totter, going up and down in the same place, with no predictability. Some days I’d have energy and be able to do a few things. Then I’d crash and be too tired to do anything but lie on the couch for days at a time. Yes, this was better than taking all day to do one load of laundry. But having my stamina return and then vanish in the blink of an eye was maddening, frightening, and oh, so chaotic. It left my head spinning. Would my strength come back this time? If so, how long would it take? What would I miss out on or who would I let down in the mean time? Would it ever come back to stay? Would I ever have a normal life again? In the midst of this turmoil, I was stealing moments of great fun. I could sew on this practice block on good days and crash days, since there was no pressure to do it right. As long as I could sit up and keep my fingers out from under the sewing machine needle, I was good to go. I practiced fusible appliqué, machine free-motion embroidery with metallic threads, and then machine free-motion quilting, also with metallic threads. My machine purred on happily for weeks, then months. While I stitched, it was as if I entered another realm, where all was peace and light; where space and time longer existed. Physical pain, fatigue, fear, and worry were all forgotten. Each time I would finish sewing for the day, I’d pin Chaos on my design wall. As it hung there, one day I noticed that the dreadful blunders no longer glared at me. Sometimes I couldn’t even find them. Then it hit me—I couldn’t throw this away! It was too beautiful to discard. In fact, it would make a great center block for a medallion quilt. 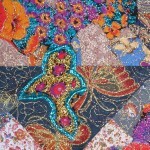 I could see it now: four borders, the same colors as the flowers I had appliquéd and embroidered. Yes! I got excited as I visualized the finished wall hanging.Eventually, it was time to add the borders. But wait! It needed something else first. The metallic threads didn’t stand out enough. I finally found some over-sized gold moire´ piping, and stitched it around my reclaimed centerpiece. Then I could attach the borders that matched the flowers. But it still didn’t feel right, so I added another layer of three dimensional borders on top of the cotton ones. I wanted something soft and comforting, so these were made of chiffon and georgette. 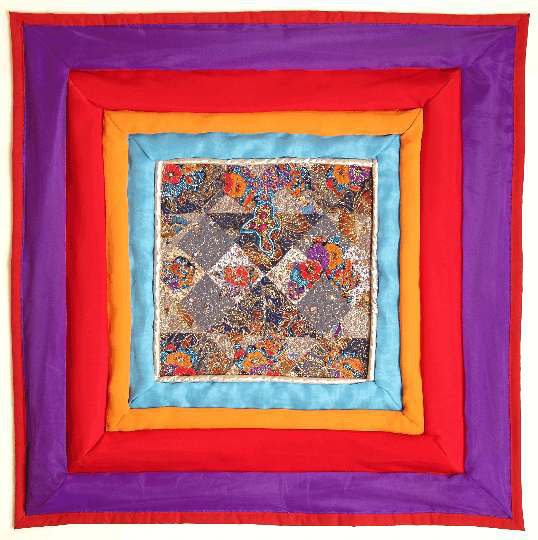 I saw that these issues in my life were all like this textile square I had gotten rid of. As I sewed on it and listened with my inner ear, it began to sink in that this throw-away block, and my life, too–could both be reclaimed — with some creativity, work (sometimes spelled P-L-A-Y) and lots of time. Grace showed up, too-in the form of what looked like an angel to me. There she was, a scrap of embroidered cloth nestled in the upper chamber of the metaphoric hourglass quilt block. How fitting! I’ve struggled with time all my life. My internal clock, if there is one, runs at half the speed (or less) than everyone else’s. I’m in tune with chairos, or seasonal time, not chronos, or clock time. My Scrap Angel said to let go of trying to control and even of having to know the timing of events in my life. She suggested that I trust, relax and enjoy the ride. That quiet voice of inner wisdom continued to speak softly as I stitched and also as I gazed at the altered threads pinned to my design wall. 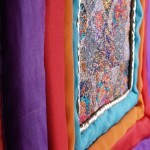 A quiet whisper urged me that all was not lost in my life, just as all had not been lost for my hideous quilt block. This fabric piece has recovered from significant setbacks. Yes, I had, too. None of my blunders mattered any more. What mattered was channeling my creativity while this adversity transformed into advantage. I had seen the metamorphosis of this worthless piece-of-junk into a shining, vibrant, work-of-art right before my eyes. What’s more, my hands had guided the cloth as my ancient relic of a sewing machine stitched along. Tossing out the rules about what could or couldn’t, should or shouldn’t be done, or how it could or should be done. Listening with my inner ear: opening up enough to receive guidance from the still small voice that speaks within–and follow it. Risking enough to transfer this counsel to my life. Don’t throw it away just because it’s not perfect. Lighten up; have some fun and take some risks with it. Build on its tedious, yet essential structure. Transform the multitude of mistakes with loveliness. Include glowing images of things you love. Discover its vibrant themes and develop them. Add shimmer and sparkle until your eyes shine. Surround it with strong, broad borders. Create a cuddly, cozy container for the chaos. Make it elegant and regal, fit for royalty, despite its randomness and imperfection. Enter her timeless place often, and she’ll guide you peacefully through life’s chaos. If you would like a printable version of the Angel of the Hourglass, you can find it here. 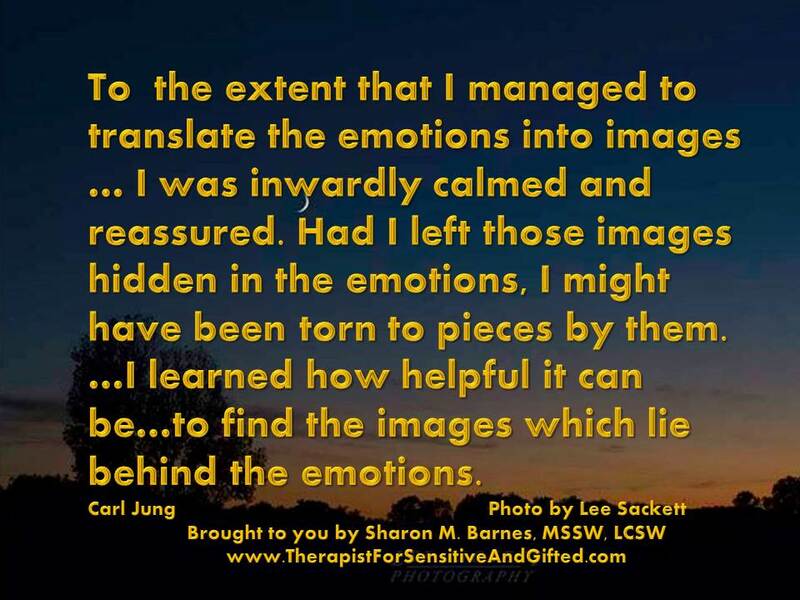 He goes on to say that after we have faithfully given form to the image(s) provided to us by the unconscious, only then is it time to begin to discover their meaning or message for us and then to translate that meaning to our lives in a practical way. reclaim your life while you’re at it. May you face your cumulative errors and misfortunes, knowing that no matter how chaotically and imperfectly things begin, they can end beautifully.